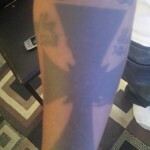 Photo was taken in Brooklyn, East New York, Linden Blvd, between Cresent & Hemlock. 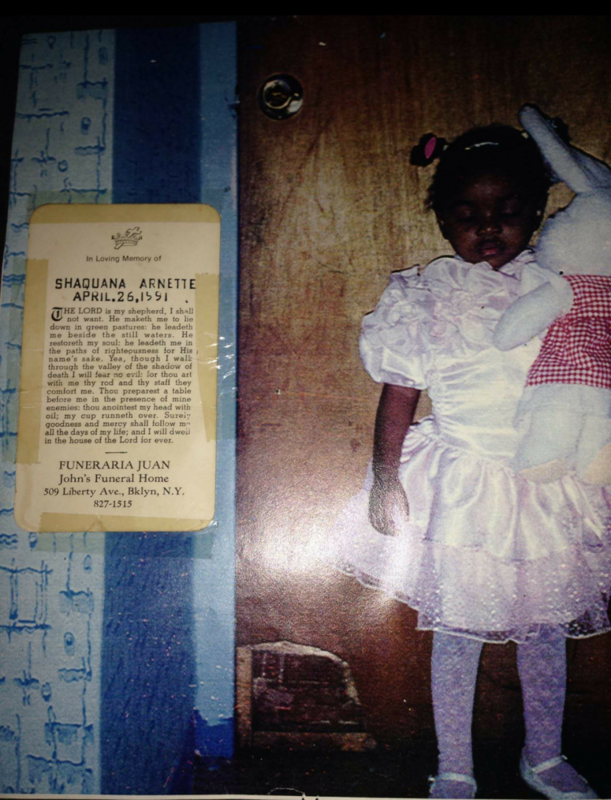 The person being commemorated is Shaquanna Arnette. Arnette was two years old when she departed this world. Arnette’s mother moved the two of them to St.Thomas to live with her boyfriend. In St. Thomas the boyfriend raped, beat, and burned Arnette on a stove. The boyfriend served nine months because there was no law for child abuse in 1992. Arnette is being honored because there’s is now a Shaquanna law put into place so nothing like this can again. This story can be found online,(St. Thomas paper.) During Arnette’s short life she was a very sweet baby. This story broke my heart because I have two little girls. This entry was posted in Uncategorized on March 18, 2015 by dgreene856. Photo was taken in Bronx, New York, on Webster Avenue. The person being commemorated in this photo is Angie Cruz. Cruz was a loving wife, mother, sister, aunt, and grandmother of eight grandchildren. In 1993 Cruz started to get sick, late 1994 she died due to her sickness. When I asked Cruz family about her, as the family members spoke I felt the love she brought to their lives. I feel, as if Cruz was a caring, beautiful person inside and out. I wish that I had the opportunity to meet her, and I wish she could have had the opportunity to meet my children; her great grandchildren. 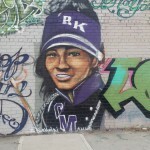 Photo was taken in Brooklyn, East New York, on Ashford Street, between Stanley & Linden Blvd. The person being commemorated in this photo is Tanya Grant-Copeland. 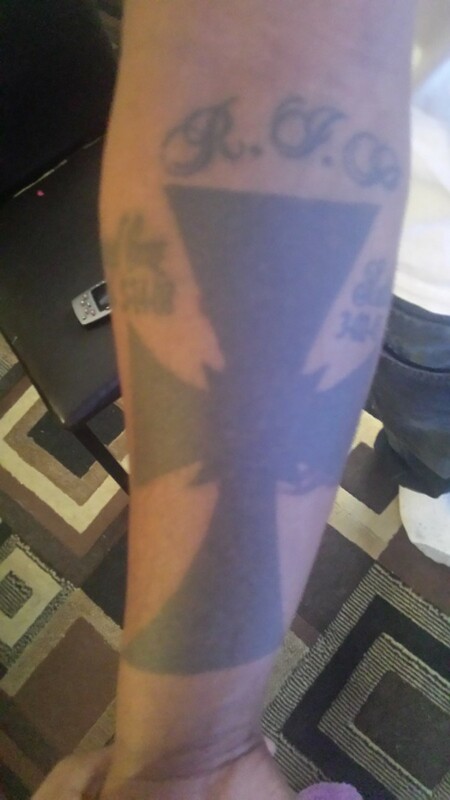 Copeland was a drummer in a non profit band located in Brooklyn. One evening after band practice Copeland was walking home when she was viciously attacked. Someone stab her in her neck, back, and abdomen more than 30 times. More information about Copeland can be found pix11.com, channel4.com, news12.com. This picture was take at the corner of 33rd Street and Mermaid Avenue in Coney Island Brooklyn, NY which is now named “Robert ‘Mr. 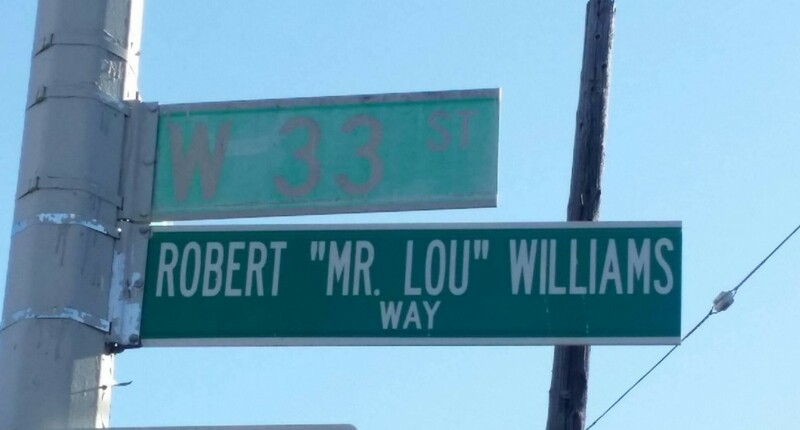 Lou’ Williams Way” in memory of this great mentor. The installation was followed by a youth basketball game at Public School 288, 2950 West 25th Street, and a party at Footprints Cafe, 1521 Surf Avenue. When basketball legend Stephon Marbury comes home to Coney Island, he’s sure to shed a tear at the corner of West 33rd Street and Mermaid Avenue in Coney Island, which is now also named “Robert ‘Mr. 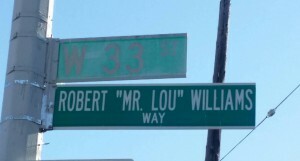 Lou’ Williams Way” in memory of his late mentor. A human ribbon of mourners assembled at the intersection, near where Williams lived, worked and volunteered, to immortalize the beloved sports coach who had guided and molded hundreds of talented players throughout his three decades as a local trainer in and around the Mermaid Houses, 3116 Mermaid Avenue; among them, NBA stars Sebastian Telfair and Quincy Douby. Williams, who passed away at his home at O’Dwyer Gardens, 2952 West 31st Street in 2007 at the age of 64, was recalled with glowing words and misty eyes during a poignant ceremony organized by Councilmember Domenic Recchia, who legislated for the co-naming through the City Council, and which distinguishes Williams as being the first African American to have a street named after him in Coney Island. This entry was posted in Uncategorized on March 17, 2015 by Vanessa Young. 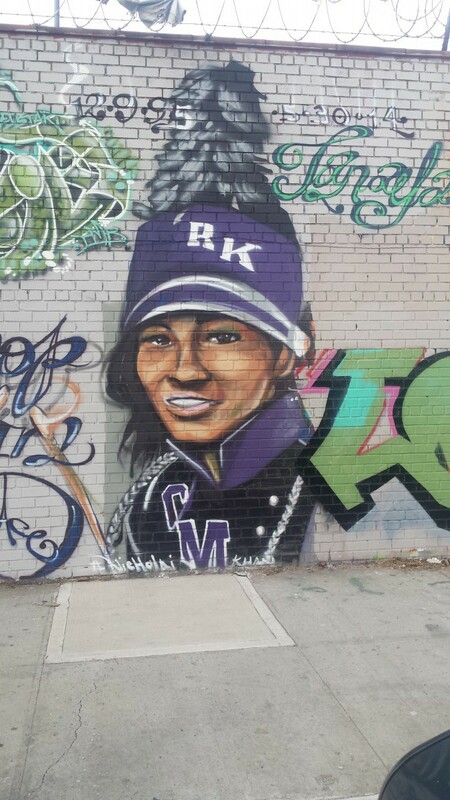 Photo was taken in Brooklyn, East New York. The person being commemorated in this photo is Zsatavia F. Haynes. She was also know to everyone that knew her as princess Tay-Tay. 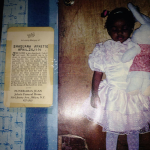 Born in Brookdale Hospital located in Brooklyn, East New York at one pound and a few inches. 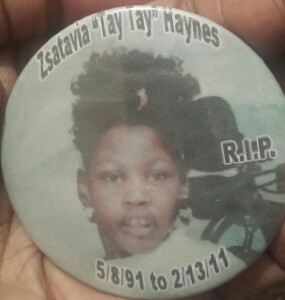 She’s being honored due to her life ending at the age of nineteen, on February 13, 2011. Doctor’s said she would not live pass her tenth birthday because she had cerebral palsy, which left her unable to walk, talk, or feed herself. Even with all her disadvantages she still was able to speak without words with her bright smile, she would scream with excitement whenever some one she adore walked into a room, and she would cry whenever she was disappointed. She could not speak, but left a big void in everyone heart with her departure. This entry was posted in Uncategorized on March 17, 2015 by dgreene856. This picture was taken from the oval plaza and entryway to Prospect Plaza at the Grand Army Plaza in Brooklyn, NY. It is of Union Army general Gouverneur Kemble Warren (1830-1882). He was honored for his bravery before and during the Civil War. This was well deserved and shows great dedication towards one’s country. This sculpture by Henry Baerer (1837–1908) honors the distinguished Union Army general Gouverneur Kemble Warren (1830–1882). It is one of three Civil War monuments that grace this oval plaza and entryway to Prospect Park, which was first laid out in the 1860s and dedicated in 1926 to the Grand Army of the Republic (the Union Army in the Civil War). 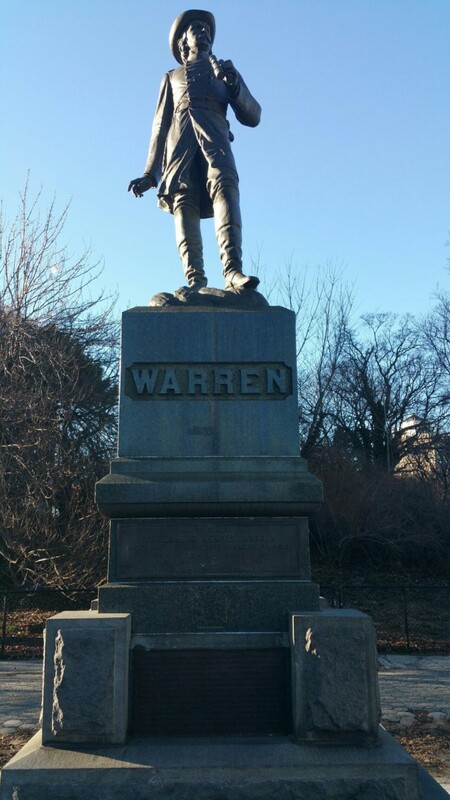 General Warren was born in Cold Spring, in Putnam County, New York. He graduated from the United States Military Academy at West Point in 1850. Before the Civil War, he helped the Army Corps of Engineers survey areas west of Mississippi, oversaw rapids and canal improvements, and taught mathematics at West Point. Warren was named Lieutenant Colonel of the Fifth Regiment in New York in 1861, and fought at Big Bethel, Virginia. Later, as Captain, he led the Yorktown siege of 1862, and was engaged in combat at Malvern Hill, Harrison’s Landing, Second Bull Run, Antietam, Centreville, and Fredericksburg. He was appointed Brigadier General in September 1862, and named Chief Topographical Engineer of the Army of the Potomac in 1863. At the famous battle of Gettysburg in 1863, he was wounded at Little Round Top, and a monument was later placed there to commemorate his valor. Warren subsequently served as the chief engineer and the commanding officer at numerous battle sites, though his actions were questioned at Five Forks in Virginia. One account said Warren “made victory decisive there,” but General Philip Sheridan, feeling that Warren was negligent in his duties, relieved him of his station. Though a court of inquiry exonerated Warren of Sheridan’s charges 14 years after the war, Warren was said have been broken personally and ruined professionally. Warren remained in the armed services as a Lieutenant Colonel of Engineers until he died in Newport, Rhode Island on August 8, 1882. Sculptor Henry Baerer was born in Kirscheim, Germany, and came to the United States in 1854. He was especially well-known as a portrait sculptor, and contributed six sculptures to the parks of New York City, including statues of composer Ludwig van Beethoven in Prospect and Central Parks, and a bust of industrialist Conrad Poppenhusen (1818-1883) in College Point, Queens. In 1938, the city monuments crew cleaned and repatined the sculpture and bronze tablet set within its base. Having since suffered more than 60 years of exposure to the elements, the sculpture was conserved in 2001. The American soldier Gouverneur Kemble Warren was born at Coldspring, New York, on the 8th of January 1830, and entered West Point in 1846, graduating in 1850. He was assigned to the engineers, and for several years was employed in survey work in the West, where he took part in some expeditions against the Indians. In 1859 he was made assistant instructor in mathematics at West Point. But two years later, at the outbreak of the Civil War, the scientific subaltern was made lieutenant-colonel of volunteers and posted to the newly raised 5th New York Volunteer Infantry. He was fully equal to the task, for his regiment was very soon brought into a state of marked efficiency. In August he was promoted colonel. He commanded a brigade of the V. corps at Gaines’s Mill, Second Bull Run and Antietam, and was shortly afterwards promoted brigadier-general of Volunteers. During the Fredericksburg campaign he was on the engineer staff of the Army of the Potomac, but after Chancellorsville he was appointed chief of engineers in that army, and in that capacity rendered brilliant services at Gettysburg, his reward being promotion to major-general U.S.V. and the brevet of colonel in the regular army. When the Army of the Potomac was reorganized in the spring of 1864 Warren returned to the V. corps as its commander. His services in the Wilderness and Petersburg campaigns proved his fitness for this large and responsible command, but his naturally lively imagination and the engineer’s inbred habit of caution combined to make him a brilliant but somewhat unsafe subordinate. He would have become one of the great chiefs of staff of history, or even a successful army commander, but he sometimes failed where a less highly gifted man would have succeeded. He was at his best when the military situation depended on his exercising his initiative, as on the first day in the Wilderness, in which his action saved the army, at his worst when, as on the 10th of May before Spottsylvania, he was ordered to attempt the impossible. On the latter occasion bothUlysses S. Grant and George Gordon Meade threatened to relieve him of his command, and Humphreys, the chief of staff of the army, was actually sent to control the movements of the V. corps. This entry was posted in Uncategorized on March 15, 2015 by Vanessa Young. When Hollywood tells you a movie is “based on a true story,” that means you’re about to eat popcorn while watching lies. The Jackie Robinson movie,”42,” begins with those words on the screen. OK, I buy in. I know nuance runs second to amped-up drama in big-budget movies. Still, let’s talk about one scene. During a game in Cincinnati, when Robinson is the target of racist harangues from the box seats, Pee Wee Reese walks across the infield grass. He walks slowly. The music suggests suspense. Reese walks from shortstop to first base. There he hangs an arm over Robinson’s shoulders. They chat, the white man from Kentucky and the black man born in Georgia. Reese is smiling, laughing. Robinson’s face shows confusion slowly reshaping itself into contentment. The music rises to let us know This Is The Drama, Folks. Long before the movie, people raised money to immortalize the moment in bronze. At Brooklyn’s minor league ballpark, a heroic statue shows Reese with his arm over Robinson’s shoulders. The moment was brave, caring, even sweet. Except, most likely, it never happened. Whatever happened, maybe it happened in Cincinnati, maybe in Boston. It could have happened anywhere in the late 1940s when Jim Crow laws and customs divided Americans. In “42,” it happens at Cincinnati’s Crosley Field in 1947. Reese, portrayed as a Southern innocent, if not a yokel, complains to the Dodgers’ boss, Branch Rickey, about a letter threatening him if he plays alongside Robinson. Rickey trumps that single letter with hundreds addressed to Robinson. Thus instructed, Reese realizes the burden that Robinson has carried alone through that season. So, hearing the Crosley Field racists, Reese crosses the infield to Robinson. The crowd is rendered silent. They laughed and went on warming up. That would make a nice statue, too. 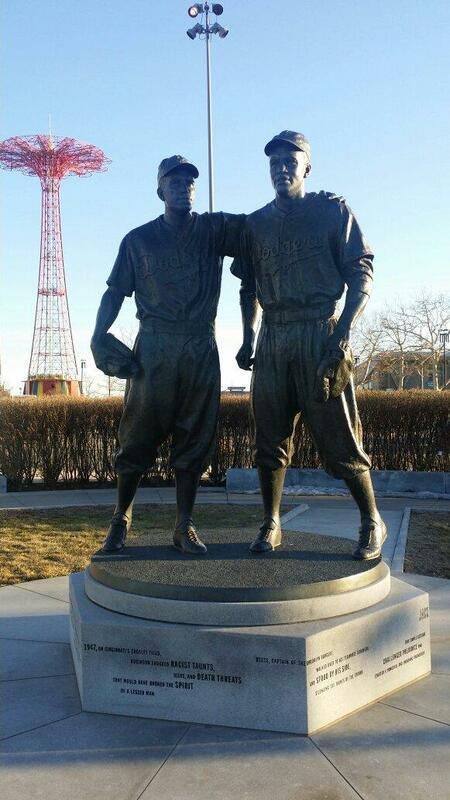 This picture was taken at the Brooklyn ball field, KeySpan Park in Coney Island of Jackie Robinson and Pee Wee Reese of the Brooklyn Dodgers, who were honored for breaking the long-held racial barrier in the major leagues during the 1940’s. I think this is a very powerful and strong message, and also serves as a reminder of how far we have come. 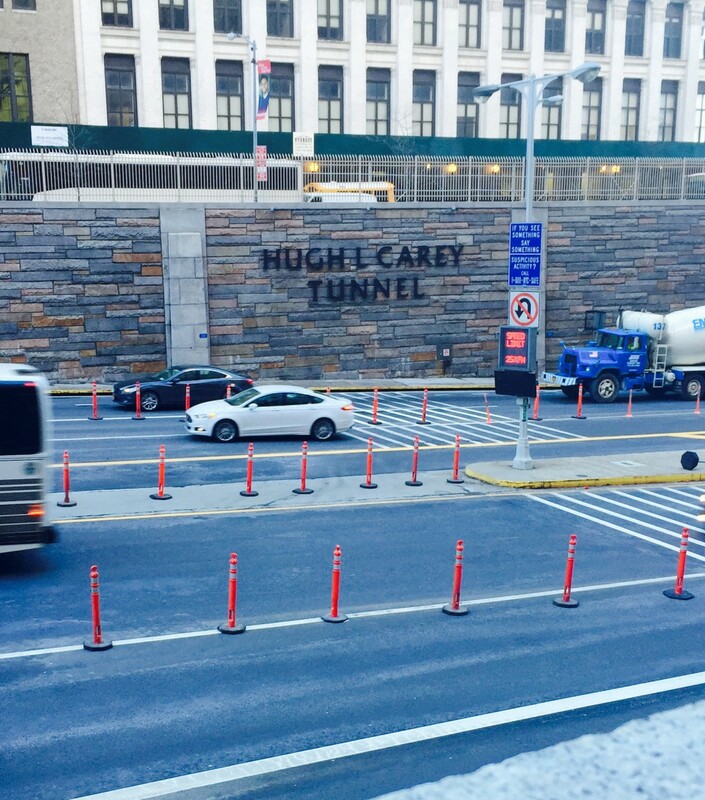 This picture was taken near the Battery Tunnel which is now called “Hugh L. Carey Tunnel” It was very challenging to get this shot of this picture that I risk placing my iphone on the edge of the bridge I was standing on just so I could have zoomed in. It was a very tedious momemt for me, but it felt really accomplishing after I was done. Hugh L. Carey, the governor who helped rescue New York from the brink of financial collapse in the 1970s and tamed a culture of ever-growing spending, died Sunday at his summer home on Shelter Island, N.Y. He was 92. His death was announced by the office of Gov. Andrew M. Cuomo. “Governor Carey led our state during a time of great financial turmoil and pulled us back from the brink of bankruptcy and economic ruin,” Mr. Cuomo said in the statement. From 1975 through 1982, as the state’s 51st governor, Mr. Carey led a small group of public servants who vanquished the fiscal crisis that threatened New York City and State — the direst emergency a governor had faced since the Depression — by taking on powers over the city’s finances that no governor had wielded before and none has wielded since. Hugh Carey rose to power as a Democrat outside his party’s machine. He began the 1974 campaign for governor as a recently widowed congressman from Brooklyn, a long shot who was not taken seriously, yet he cruised to one of the most resounding victories in the state’s history. But he spent his final years as governor frustrated. Absent an emergency, he often seemed bored with the job. Running as a Democrat, Carey was elected to the United States House of Representatives in 1960, unseating Republican incumbent Francis E. Dorn. He served seven terms. He served on the House Ways and Means Committee and led the effort to pass the first Federal Aid to Education program. He was elected Governor of New York in 1974 and resigned his Congressional seat on December 31, 1974. Carey was reelected in 1978, serving two full terms as Governor. On January 1, 1983 he was succeeded by his lieutenant governor, Mario Cuomo. 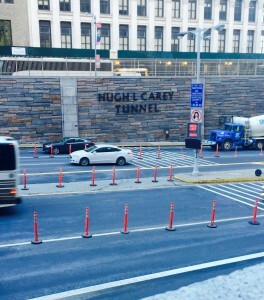 Carey then returned to private law practice with the firm of Harris Beach in New York City, where he resided until his death in August 2011. He was the first congressman from Brooklyn to oppose the Vietnam War. Carey became the state’s first Democratic Governor in 16 years when he was elected governor in 1974, unseating incumbent RepublicanMalcolm Wilson, who had assumed the office after Nelson Rockefeller resigned in December 1973 (to work on the Commission on Critical Choices for Americans). Nationally, the 1974 election were dominated by the Watergate scandal which had destroyed President Richard Nixon‘s presidency and impacted negatively Republicans in general, making them nationally unpopular. In 1974, Democrats also recaptured the New York State Assembly. Carey is best remembered for his successful handling of New York City’s economic crisis in the late 1970s. As Governor he was responsible for building the Jacob K. Javits Convention Center; Battery Park City; the South Street Seaport and the economic development of the NYC boroughs outside Manhattan. He also helped provide state funding for the construction of the Carrier Dome at Syracuse University. He is also remembered for preventing conservative legislators from reinstating the death penalty and preventing such legislators from taking away state abortion laws. In 1947, Carey married Helen Owen. They became the parents of Alexandria, Christopher, Susan, Peter, Hugh, Jr., Michael, Donald, Marianne, Nancy, Helen, Bryan, Paul, Kevin, and Thomas. His wife, Helen, died of breast cancer in 1974. Peter and Hugh, Jr. died in an automobile accident in 1969. Paul, who served as White House Special Assistant to President Bill Clinton as well as 77th Commissioner of the Securities and Exchange Commission, died of cancer in 2001. 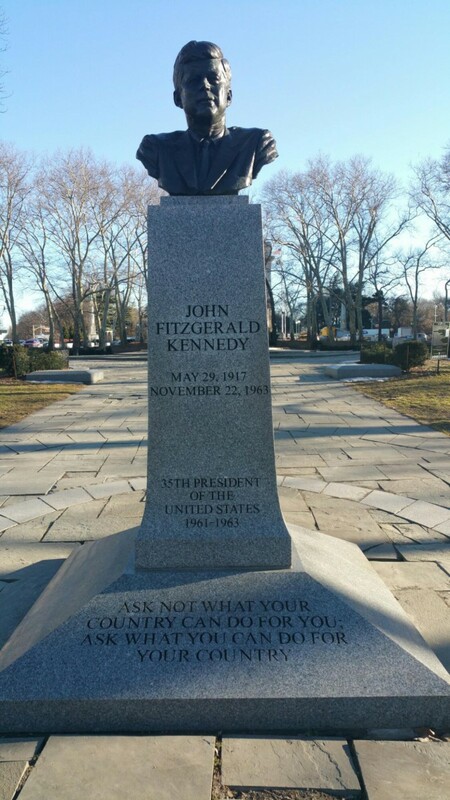 This monument honors John Fitzgerald Kennedy (1917-1963), the thirty-fifth President of the United States. After serving as a naval officer during World War II, Kennedy was a United States Congressman from Massachusetts from 1947 to 1953, and a United States Senator from 1953 to 1960. Narrowly defeating Richard M. Nixon in the tightly contested election of 1960, he was elected the nation’s first Catholic president. As president he launched initiatives such as the Peace Corps, and with Great Britain and the Soviet Union signed the nuclear test-ban treaty of 1963. He also weathered the disastrous Bay of Pigs Invasion of Cuba (1961) and Cuban Missile Crisis of 1962. On November 22, 1963 he was assassinated in Dallas, Texas by Lee Harvey Oswald. Shortly after the assassination on November 22, 1963 of President John Fitzgerald Kennedy, Brooklyn Borough President Abe Stark proposed to Mayor Robert F. Wagner and Parks Commissioner Newbold Morris that a monument be erected in Kennedy’s honor. The American Institute of Architects sponsored the monument competition, and Morris Ketchum, Jr. and Associates were selected to design the monument. The promontory where the monument is situated in Grand Army Plaza, was selected for its physical prominence, historic significance, and scenic beauty. The monument’s design went through an evolution, and one time included an eternal flame. Eventually the design was reduced to a more modest oblong pedestal sheathed in Vermont marble, from which projects a bronze portrait bust of Kennedy, crafted by noted Brooklyn-based sculptor Neil Estern (born 1926). Estern, then at the outset of his career, later served as president of the National Sculpture Society, also created the statue of Mayor La Guardia in Manhattan and a sculpture of Franklin Delano Roosevelt, Eleanor Roosevelt, and their dog Fala, at the FDR Memorial in Washington, D. C.